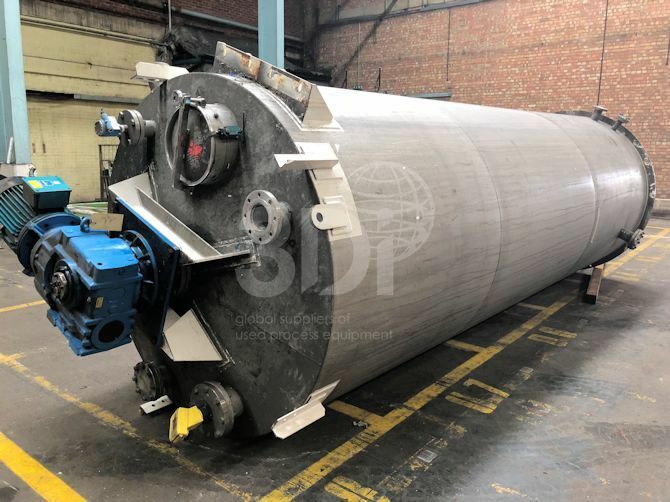 Used 15,000 Litre Stainless Steel Mixing Vessel, manufactured by Moorcroft Engineers Ltd, 1998. Material of construction: 304 stainless steel. Orientation: vertical, cylindrical, flat sloping base, tented top. Dimensions: 5650mm on the straight, 1905mm internal diameter. Design: design code G.E.P, design pressure atmospheric, design temperature ambient. SG: 1.6. Thickness: 5mm thk shell and roof, 6mm thk bottom plate. Vessel is fitted with an APV top mounted triple flighted turbine agitator, powered by a 8/12.5kw Brook Hansen electric motor. Previously used to mix water based paints.